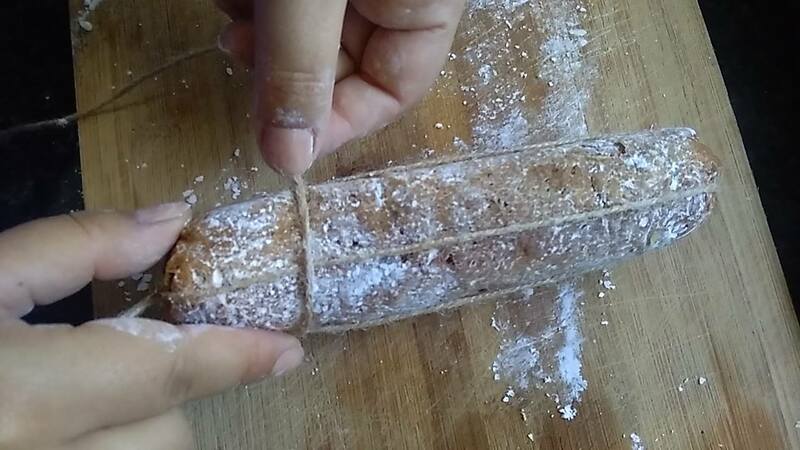 After a few days away on a family reunion for Easter, without cooking for 4 days I felt that the best way to chill out and relax would be crafting a tempting looking vegan salame (or salami, as internationally known). I must admit this vegan salami experiment was good fun! The result is very satisfactory, both for the eyes and tastebuds. I initially based my idea on this recipe found on the Vegspinz blog but I have heavily modified my version just because I like to use ingredients I might have already available at home and see what happens. Being born and living in Italy for most of my life as a meat eater until the age of 36, I well remember all the different types of ‘insaccati’ (processed meats) available from the Italian culinary tradition. Salame, prosciutto, speck, coppa, mortadella just to name a few. I have had a look on the Italian recipes to find out which spices are used to give the otherwise bland meats those characteristic flavours and used them in my experiment (obviously without the flesh of a murdered being!). I will give you my recipe first, and then share some thoughts I had while having fun with the vegan salami experiment. Pour the mixture into a large bowl and now it's time to add the flours and the black pepper and knead for a few minutes so that the gluten flour is activated properly. Add the oilve oil and add more water if the dough is too dry. I like leaving the black pepper whole in the final product, but if this bothers you you can simply use grinded pepper in it. The cayenne pepper and the other spices are just dosed based on my taste, so just go with your preference when spicing up your vegan salami! Now the fun part: shaping the salami into some pre-oiled foils, secure it firmly on the sides and put it into a metal colander over a pan boiling water for about 40 minutes. Slice to use in paning, braise, bake, use on pizza. This vegan salame is just a treat and the extra cannellini addition give it a nice rich extra proteic touch. I hope you enjoy, and I whould reccomend not making these sausages too thick, for a better result. Brava! I’ll try to make one too sometimes :-). I have never seen pea flour for sale so can I make pea flour by grinding dry split peas would that work? Great recipe, Lucia! And I love your comment about Easter eggs, LOLOL! I use buckwheat flour for my sausages, salame, etc. – I find it gives a firmer texture than besan (chickpea flour), which is great if you’re going to be using them with a sauce or in a casserole, etc. I use 1 tbsp buckwheat to 150g vital wheat gluten. I’ve not actually used pea flour with VWG though – I’ll have to give it a try. What is the texture like? Is it chewy, or quite loose? For anyone who can’t find pea flour, it can usually be found in the fitness supplements section of health food stores, or in online stores which sell health and fitness supplements (that’s where I buy mine), and is generally referred to as pea protein (but it is actually pea flour). This looks great, and I love the extra finishing touch of tapioca starch.